Having written a post about being busy and letting several "projects" fall by the wayside, those of you who know me will not be surprised that I have since decided to do Nanowrimo this month. Yes, trying to write a 50,000 word novel in one month is insane under any circumstances. Trying to do so whilst wrangling a pre-schooler and also somehow trying to have a life is going to lead to even more sleep deprivation. Yay!! Fancy joining me? In order to keep the insanity at manageable levels, I'm adopting the attitude of "Let's just see what happens." If I manage to make even half the expected word count, I'll be happy. I think part of the entire point of NaNoWriMo is that really, it's the sort of thing literally NO one has time for. And therefore, if you have the smallest inkling of a desire to do it, you should just go for it. So yay, you, for just going for it! 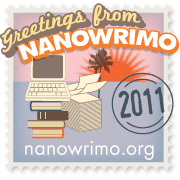 As I commented on another blog just the other day, I finally had to confess to myself one year that, as much as I *adore* the concept of NaNoWriMo, I have zip-zero-zilch interest in writing fiction (at least as things stand now). I also commented that that realization was kinda like wanting desperately to go to the ball with all the rest of the cool kids, but realizing that I absolutely *hate* ballgowns and punch and glass slippers and dancing. ;-) But I hope you have a blast and generate your 50,000 words easily and with great joy! Not this time Changa - I gave up half way through, when, like Amy, I realised I didn't want to write a novel after all!! !